This was a freelance piece about the Model City sustainability project at Biosphere 2, for Tucson Weekly. Like a city out of science fiction, Biosphere 2’s spaceship-like campus is a testing site for new solar technology. In the coming months, photovoltaic panels for collecting solar energy will line the hills surrounding Biosphere 2 like a ring of power-generating armor. This is just part of a project led by Nathan Allen, sustainability coordinator and staff scientist, to turn the campus into an energy efficient model for cities. 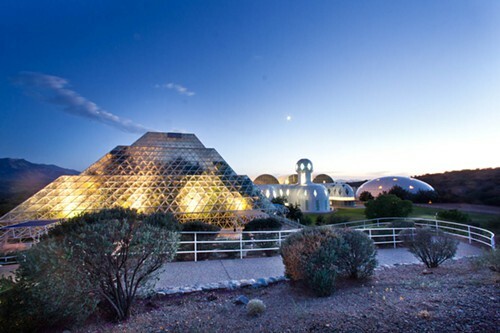 The idea of a Model City is to use solar panels to power Biosphere 2’s 40-acre campus and use water-harvesting techniques to create what would be an example of an environmentally sound municipality with efficient energy generation and use. The idea of a Model City is to use solar panels and water-harvesting techniques to create a prototype of how environmentally efficient technology can help reduce energy use and costs for communities that switch to sustainable technology. For Hipstamatic images, click here.